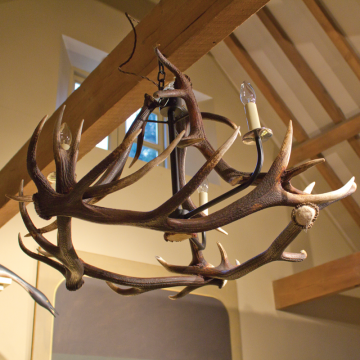 Working with real antlers naturally shed from deer in the Highlands of Scotland, we have a growing range of chandeliers. With bronzed metal armatures, supplied with rose and chain, each of these chandeliers are unique. 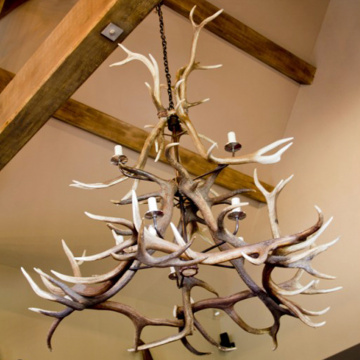 Every chandelier relies upon a careful balance of hand-picked antler horns to create ‘cottage’ chandeliers for small rooms or where there are low ceilings. Where space allows, there are the grand and double chandeliers for raised roofs, barns and stairwells. Height: 1,400mm / 55 1/8"
Width: 1,200mm / 47 1/4"
We have been requested to create an outstanding chandelier that is suitably proportioned to create a real statement in large scale surroundings, where there is a high vaulted ceiling or a tall stairwell. This double chandelier is our response with two tiers of lights real Scottish antlers intertwined to create this dramatic chandelier.Bulbs require.. 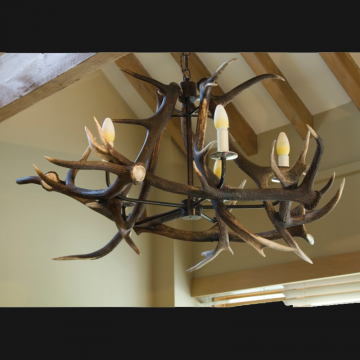 Height: 900mm / 35 7/16"
Width: 1,000mm / 39 3/8"
Naturally shed Scottish antlers assembled to a unique design – every one will be slightly different according to the shape of the antlers.Bulbs required E14 (small edison screw 14mm)We would recommend you contact us to discuss your exact requirements before ordering as each product will be individually made to order. .. 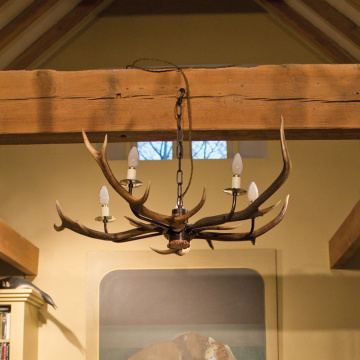 Naturally shed Scottish antlers are assembled to a unique design to create this 5 arm chandelier. The antlers are attached to a bronzed metal frame. Hanging rose and chain are included.Your chandelier will be unique every one will be slightly different according to the shape of the antlers available to us. Collected from the Scottish hillside as th.. Naturally shed Scottish antlers assembled to a unique design – every one will be slightly different according to the shape of the antlers.Dims: 1mtr diameter 60cms high with additional chain for hanging. 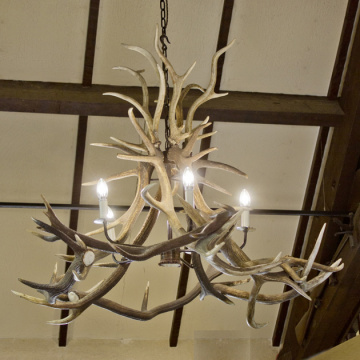 These dims will vary.Bulbs required E14 (small edison screw 14mm) We would recommend you contact us to discuss your exact requirements before orde..
Made from naturally shed antlers, collected for us in the Scottish Highlands. The ‘cottage’ chandelier as its name implies is suitable for a location where room height is restricted or a shallower chandelier is appropriate. As with our other antler products, these are unique designs on each occasion. Bulbs required E14 (small edison ..